Open the box and enter the good life... Thanks to Robb Vices of course! There’s a two-prong approach to the success of Robb Vices. As a subscription model, as well as a way to thank loyal customers for their business. In both ways, it has continued to maintain the most elegant image while providing the highest quality box one would ever lay hands on. For this review, we’re going to remain focused mainly on the Robb Vices subscription offering as it tends to be the most popular.​​​​ Not everyone has a chunk of change they can spend on customer appreciation/gifts​​​​, and that’s completely understandable. You’ll also quickly notice that Robb Vices embraces the finer things of life. Even the classier people approve, and honestly upscale is what their intended audience ​​​​loves. This is by far the most distinguishing feature of Robb Vices, and sets them far apart from the rest. What makes Robb Vices unique? •Bringing you the finer things in life, it’s what they do. The finer taste is what makes Robb Vice stand out on its own among competing subscription services. Not only do you get a bottle to pop, you get first class service and accessories to add some freshness to the other areas of your life. Inside the box, your personal pathway to the good life. Enough said. Robb Vices includes an editorial in each month's subscription that gives you an in-depth explanation of each item in the box. This adds to the quality feel of the service as well as broadens the customer's knowledge. Everyone has their own set of preferences, and nobody knows it better than the team behind Robb Vices. Luxury has met style, and been bundled beautifully in a beautiful box that states its presence upon arrival. Gone are the days of limited box selections. Leading the pack isn’t easy, but they do a fine job of it. Luxury demands those who cherish it, Robb Vices delivers. Unique subscription box that is sure to enchant anyone. You’ll find the contents are worth 2 times to 5 times the subscription cost. A higher price tag comes for those with the finer taste. Of course free trials are unheard of due to the level of quality. You’ll not only receive wine, so if you don’t need more it might not fit. Everything is as straightforward as it can possibly be when signing up for a Robb Vices subscription. Below you’ll see the 3 steps that it entails. •Choose the Robb Vices package that fits you the best. With more than a handful of options, you’re sure to find a selection of contents that suit your intended purpose; Whether it’s for you or someone else, picking out the right fit couldn’t get any easier than Robb Vices has made it. •Take advantage of money-saving opportunities during checkout. A lot of the times they’ll throw in special deals during the checkout process for a limited time. This is to encourage a higher ticket and help promote some of the other things their subscribers could benefit from having. •Await your box of elegance, which will now come every month. When you take a step onto the Robb Vices side of life, you’re in for one of the finest treats found in all the land. Waiting for your new box to arrive in the mail is the hardest part, unless you “cheat” and get it delivered more than once a month. For a little shy of a benjamin monthly (or other recurring date set by you), your Robb Vices box will be delivered to your door. You do pay for what you get, but they make sure that you get the most bang for your buck. The contents of the box are worth way more than the cost of your recurring Robb Vices subscription. Only those who demand excellence need apply. Robb Vices isn’t for everyone, but it sure is for those who embrace the control of their own life, resources, and wealth. With that said, it’s definitely a must-have if you can spare the extra change periodically. You’ll find a lot of support for Robb Vices, as it has truly changed the way that people live. It has delivered the kind of ambience only treasuring the finest things in life can provide. By not just offering alcohol in select boxes, they take it a step further with other great additions for one to have. Tie it all together with an editorial on how everything in the box is connected, and you truly have a priceless experience that no price tag will do justice. When it comes to the hard to please that have virtually everything, this will definitely surprise them as they would just learn of its existence. You have the average subscription boxes, then you have the above average subscriptions, and then you have the most elite of them all. Robb Vices falls into the latter without a doubt. When you want the best that the world of wine/finer life subscription boxes have to offer, be prepared to pay the price as it doesn’t come cheap. However, you found THE true source that has continued to stand tall above the rest over the years. No more guessing and hoping you found something exotic, this is the Porsche of subscription boxes. Affordability is critical, why the high prices? When you go to a fine dining establishment, you don’t question why they’re a little more than fast food. That is how it is with Robb Vices. You’re getting the most premium solution on the market, but at a higher cost (which is still decent for what it is). Call on them for the help you need, but is it there? One thing that Robb Vices has ensured is that they tend to keep their customers happy. You can’t have a premium service without providing industry-leading support. And this is exactly what the team behind the scenes makes possible each and every day. How much control does one have over the subscription? From changing the type of box you receive to pausing deliveries, Robb Vices makes sure that you can have it the way that you want it. If it can’t be handled directly on their website, a simple phone call will get things taken care of. No getting stuck with unhappiness here. Is there a proven track record that Robb Vices lives up to its rep? Absolutely, they have one of the best track records we have seen among subscription services of its kind. They continue to prove that they have what it takes to provide premium subscription boxes highlighting the finer way of life without sacrificing the long lost art of customer care. Transparency is key, and it’s clear Robb Vices knows this. A lot of subscription services will leave things a mystery, especially when it comes to the contents featured in their monthly boxes. Robb Vices lays each option out in its entirety so you can see exactly what you’re getting before it’s even in the mail. What if I need to learn more about Robb Vices? They maintain one of the most comprehensive websites found among wine subscription companies as well as luxurious subscription companies. The answer you probably seek may already be waiting for you there. If you need more than what can be found there, just reach out as they have one of the friendliest and most helpful teams in the business. This is something that you’re going to have to take the time to think on and answer for yourself. If you live a more elegant way of life and love luxurious additions, this is the ultimate subscription box for you. Especially if you want some wine thrown in the mix. However, for the budget-conscious folks out there that just want operable, it could end up costing them more than they were willing to spend. Making it more beneficial if they sought out one of the other subscription companies that boast a more affordable service cost. For the price, it’s clear that you get a good deal when you go with Robb Vices. For those who don’t mind throwing down a little less than a hundred bucks each month, it’s a winning solution and truly the best of its kind. The strength it’ll add to your level in life is priceless. Anyone demanding luxury will definitely appreciate the work that has gone into the making of Robb Vices. Which has come to be known as the most luxurious subscription box of them all as well as the doorway to the good life. 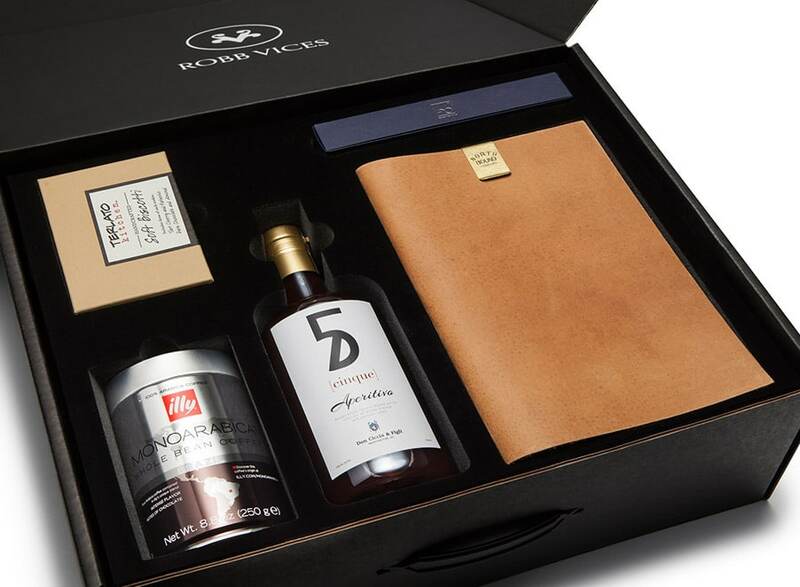 Robb Vices is the highest quality luxury box that we've reviewed. Opening the box and checking out it's contents definitely feels premium. If you are interested in exploring some luxury items, this box is for you. It's well organized and though out, but it comes with a price. These boxes are not cheap, but you certainly get what you pay for. Previous articleWine of the Month Club Review – Legit Way to Get Quality Wine?